JFK Plaza is located adjacent to city hall. Opened in 1967 and dedicated to the memory of President John F. Kennedy, the park is also at the eastern end of the Benjamin Franklin Parkway. 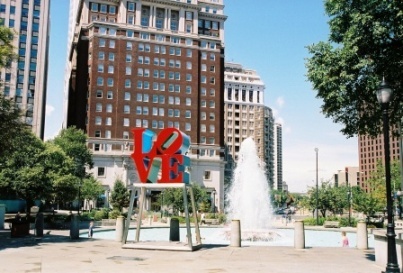 Unoffically but more commonly known as "Love Park", the plaza gained worldwide notoriety as a gathering place for skateboard enthusaists. The park is thought to be one of the best skateboarding sites in the world, and thousands of skateboarders from across the country and around the world have made the pilgrimage to this spot. Controversy swirled around the park for years as skateboarders and lunchtime workers and tourists collided, sometimes literally. A movement to close the park to skateboarding became official in 2002. Skateboarding in the park now carries a $300 fine. Still a popular spot for tourists; skateboarders and others line up in good weather to get their picture taken at the Love sculpture.